With influ­ences from “art, his­to­ry, sci­ence, the 80s, car­toons, Where in the World is Car­men San Diego, and of course per­son­al misfortune/insecurity”, Hey Champ rocks it. The band is made up of Saam Hagshenas (vox, gui­tar, keys), Jon Marks (rhythm, vox, keys), and Pete Dougher­ty (keys, synths). My name is Anya and I work for Ban­dit Pro­duc­tions. 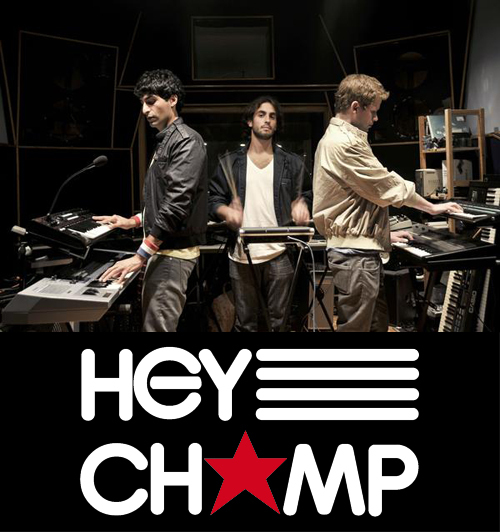 We work with Hey Champ and I am reach­ing out to blogs that have writ­ten about them in the recent past and col­lect­ing their con­tact infor­ma­tion. I was won­der­ing if I could get con­tact infor­ma­tion for this blog.